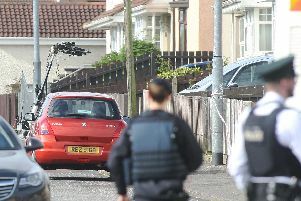 Several petrol bombs have been thrown at police in Londonderry in violence which the PSNI described as “clearly premeditated”. It came on the day of a republican Easter parade from the Creggan area in the city’s west to the City Cemetery. It is thought that seven petrol bombs, as well as masonry, were flung at officers. Police vehicles were damaged, but there are no reports of injuries at time of writing. Chief Inspector Ivor Morton said in a statement: “In relation to today’s event in Derry/Londonderry we attempted to engage with the organisers of the parade over a period of time in a bid to facilitate their event within the law. “The organisers declined to enter into any discussions with police on this matter. “The organisers also stated in the run-up to today’s event they were informed by police the parade would be stopped and would not be allowed to go ahead. “This was patently untrue and can only be viewed as an attempt by those behind the parade as a bid to raise tensions in the area. “It is, therefore, regrettable that in raising those tensions a small number of people saw fit to attack police officers with petrol bombs in what was clearly a pre-meditated attack. “I want to be clear that for anyone who engaged in actions that were unlawful or detrimental to community safety, there will be consequences through the criminal justice system. “Police will review all video footage collected today and will robustly pursue all possible enquiries to identify those involved and bring them before the courts. “I would appeal to anyone who has any information regarding this incident to contact police at Strand Road station on the 101-non emergency number. “Information can also be passed to police through your local representatives, or to your local neighbourhood policing officer.